Hola! 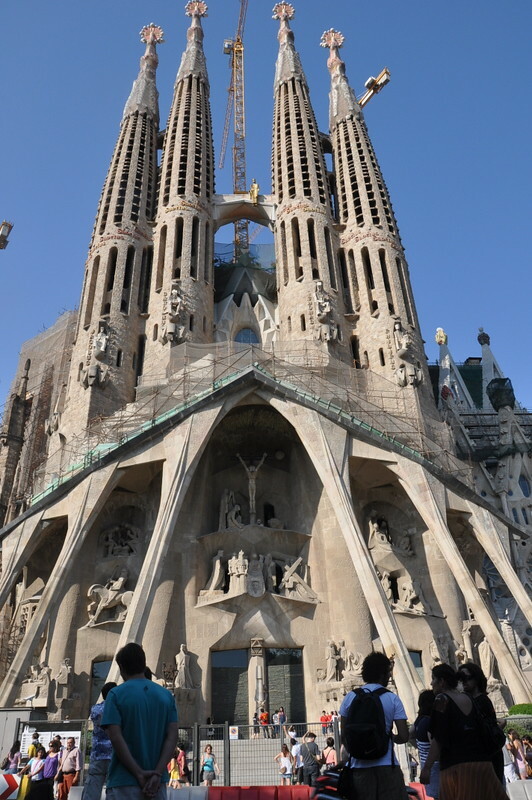 This is my last post on Spain (we'll move on to France next) and I purposely end it with a post on Sagrada Familia or Church of the Holy Family (SF), the most famous and iconic building in Barcelona. It is also one of the weirdest churches, no, make that the weirdest-looking church you'll ever see. 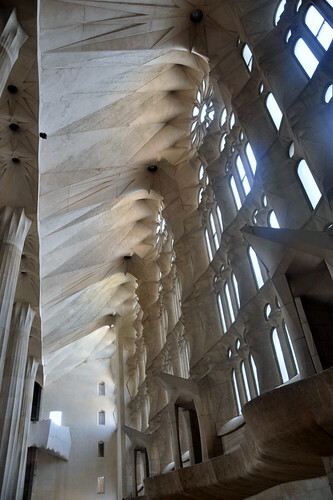 Gaudi was a devout Christian and he designed his church to glorify God (the church is not to be higher than the highest point in Spain because Gaudi said man cannot supercede God's sovereignty). He abandoned a successful secular career as an architect while still in his 30s to dedicate the rest of his life building SF, working on it for nearly 40 years before he died. He is buried in this church. We lined up for the tickets into SF one late afternoon to find a sign near the ticket booth informing that the towers would only be open the next day. That's pretty inconsiderate because they should've put the sign further down so that people who want to go up the towers don't have to line up in the hot sun. The next day, a Sunday (service was held in a small chapel of SF), we turned up early when the ticket booth opened to find that the towers were still closed. How could they! Spain reminded me in many ways of Malaysia. People work and walk slower. They aren't as efficient or precise as, say, people in the northern European cities. They like bright gaudy colors. I also had a few brushes with waitors short-changing me and a taxi driver who took me round and round. 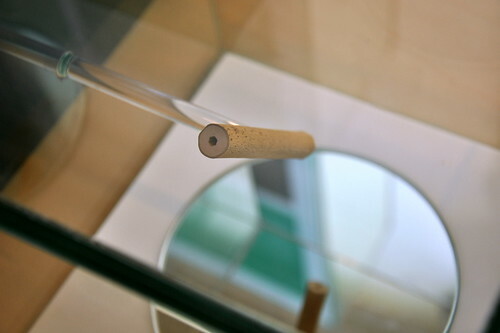 Barcelona is also the city where many of Yi's friends had their pockets picked or been robbed. At knife point. However, I didn't feel unsafe there and the people were nice and helpful although language was a problem because English was not widely or well-spoken. SF is like modern art which sometimes I'm not sure if I should admire or laugh at--if I admire it, I might be considered a fool and if I laugh at it, I might be considered uncultured. Approach to SF is undramatic, unlike famous Roman structures where a big piazza or square is always in front, giving a grand view. SF is humongous and there's hardly any frontage or garden on every side, which is a shame, considering the building's importance. There are three facades to SF. 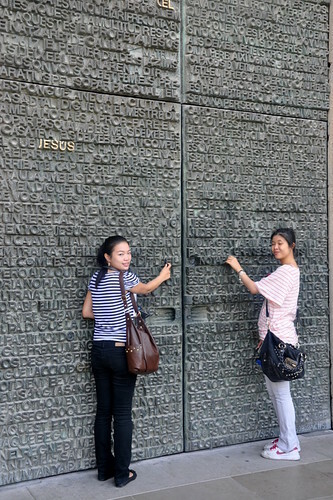 The first time we went, we were staring at the back, the Passion Facade, the side depicting Jesus' cruxifiction. 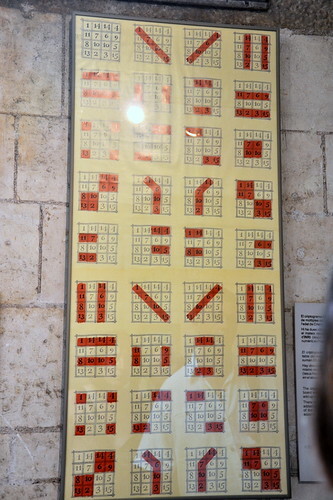 This is where you get images such as the book/Bible for Jesus' head, the cryptic board with numbers that add up to 33 no matter how you add--up, down, across, anyhow--for Jesus' age when he died. If your're familiar with the Bible, you can point out the Bible scenes (eg the soldiers betting over Jesus' garments) and passages depicted in the statues and carvings. 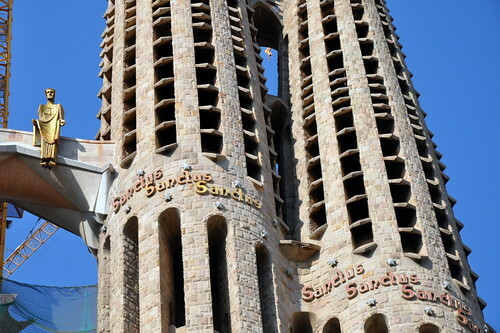 This side was done by architect Josep Maria Subirachs. 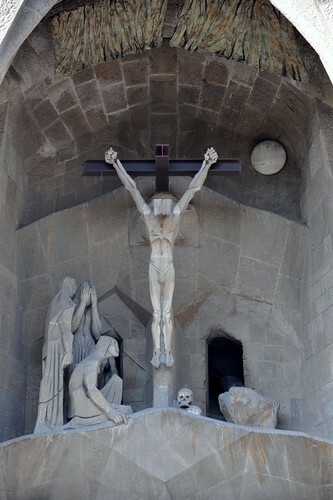 It is modern, angular, spare with many symbols and I like it but it doesn't give the effect that Gaudi wanted: a dramatic, shocking effect to the on-looker at the suffering and sacrifices of Jesus. Unfortunately, I was more awed by the architect's designs and ideas than by the scenes depicted. Sagrada Familia. The Passion Facade is the back of the church. 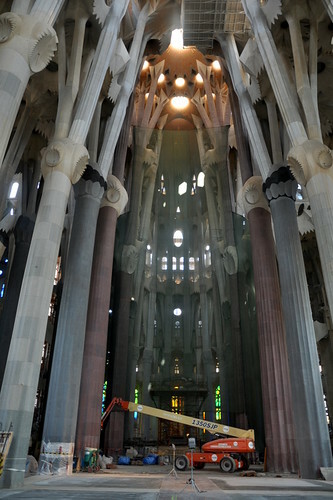 The six columns in front represent bare bones (remember Casa Batllo?) and Jesus' suffering. On Jesus' head is a book, probably the Bible or the Book of Life. 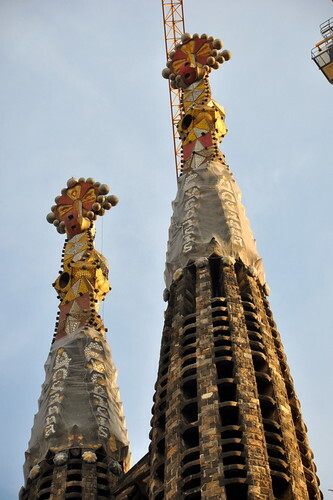 Looking like a termite hill, The Nativity Facade, the most Gaudi part of the church, is at the front. The front and back facades are so different. If you notice, the vertical columns on the 4 spires of the Nativity Facade are round, mottled and grey but scroll up to the Passion Facade above and the columns are white, clean and flat. Two different architects, two different facades. 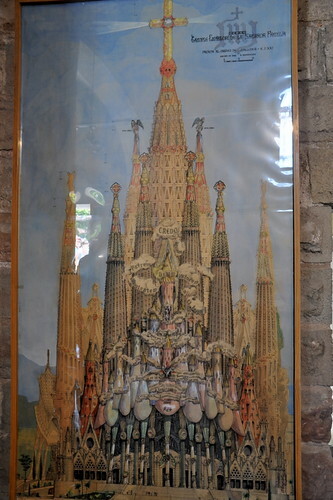 They try to remain true to Gaudi's designs but apparently he didn't leave many behind (some were destroyed during WW2). 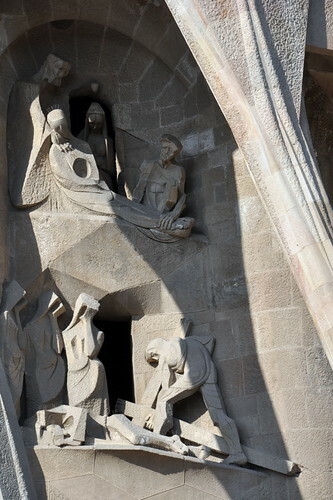 The ugly but fascinating Nativity facade, which depicts Jesus' birth was begun when Gaudi was alive and represents his work the most. It looked like mud castles but the more I looked, the more fascinated and awed I was by Gaudi's rich ideas and boldness. A turtle holding up a main column to depict long life? Carvings of animals everywhere and pinnacles or whatever they are called, topped with coloful fruits and sheaths of wheat. 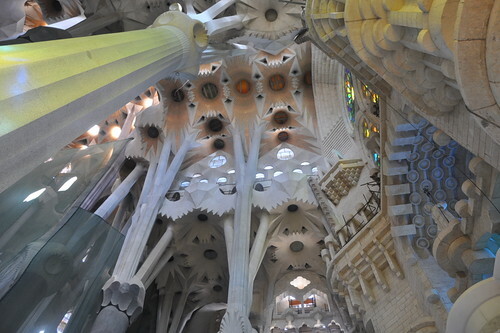 I was sure I hated it and that Gaudi was making a fool of all of us. But that was before I walked into the church. There is a third facade that's being built. That is the Glory facade, dedicating to the glory of God and will depict Hell, Heaven, Final Judgement and others. 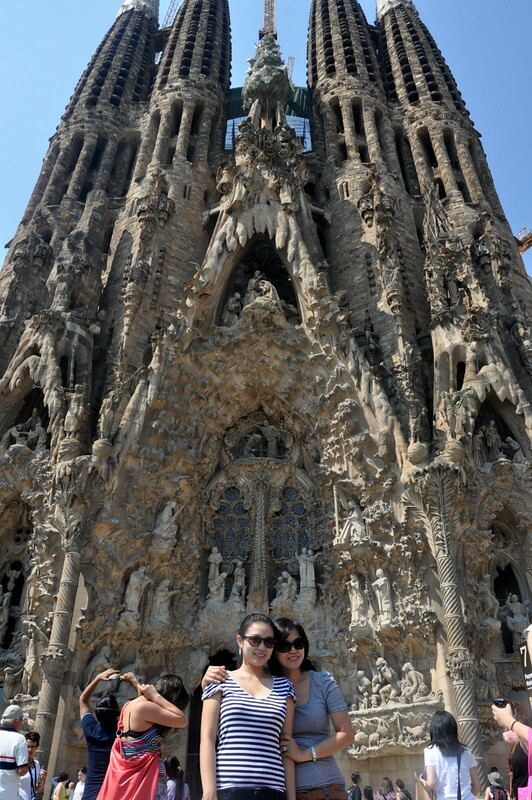 I so am coming back to Barcelona for the Sagrada Familia! 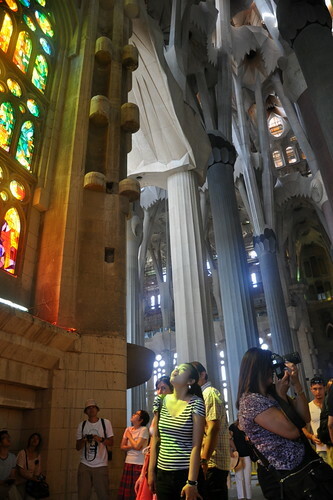 Interior of Sagrada Familia. 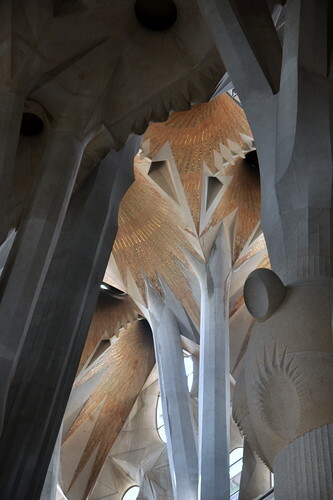 If you were standing there, would you feel like you were in a forest because that's what Gaudi wanted the interior of the church to feel like. The interior of the church convinced me that SF may even supercede St Peter's Basilica in Rome in glory and beauty, structurally, and statues nothwithstanding. There, I've said it. I expect the arrows to fly. Don't get me wrong, because St Peter's is the mother of all churches. It's trite but it's true that once you've seen St Peters', all other churches pale. That is, until you see SF. Even in its unfinished state, this church is AWESOME. The lights you see on the columns and celing are natural light diffused through stained glass windows. While St Peters' is typical of a Roman Catholic church with statues and paintings (its biggest draw being that masters like Michaelangleo and Raphael worked on it), SF, a Gothic Roman Catholic church, is totally different, with nature represented in the columns, windows and every part of the church. 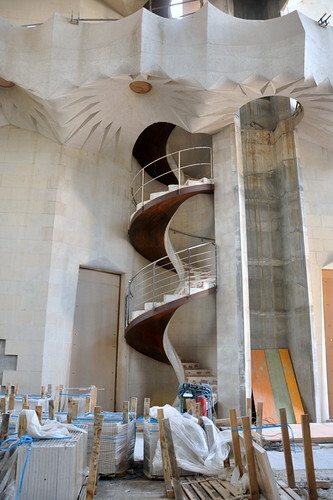 Spiral staircase inspired by the cross-section of a snail. Only a small section of stained glass wndows is up but already we could visualize the wonder and beauty of SF when completed. The stained glass windows, hyperboloids and paraboloids were designed to light up the church interior. Can you imagine how beautiful it'll look? Gaudi was amazing. I think he had an advantage in being very well-respected at that time and the private sponsors (this church is privately sponsored, not funded by The Vatican or other RC organisations) allowed him a free hand. These columns rose all the way to the top, no tiers in between! How did people cut and stood these huge and heavy columns in those days before advanced engineering and machinery? (update: an engineer suggested that the columns were installed section by section and he's right. If you look at the columns, they are pieced together although some columns, may be the newer ones, are in one piece). Anyone who loves architecture and buildings must visit SF! 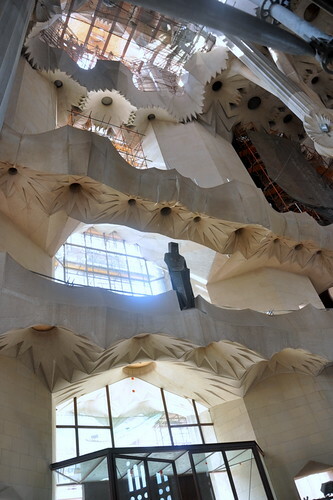 You not only feel the awesomeness of this building but also Gaudi's love for God. This section has been painted in gold and blue. It's going to be so beautiful! See how tall the columns are! Columns are cut from different materials--granite and some other hard stone--positioned depending on their hardness and ability to hold up the building. I was wishing my engineer Hub was there because he's the type to study building structures and stability everywhere he goes. Can you see the scale, how big the place is? Part of SF's fame is the fact that it's still not completed after 150 years. 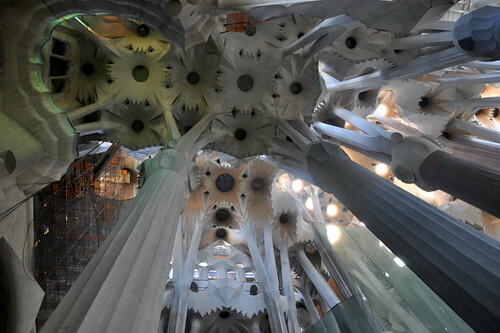 The previous date for completion was 2026, 100 years after Gaudi's death, but lately with the aid of computers and new machines, the new completion date is 2017. One major problem cited is the building of a metro line under the church which would affect the building's foundation. 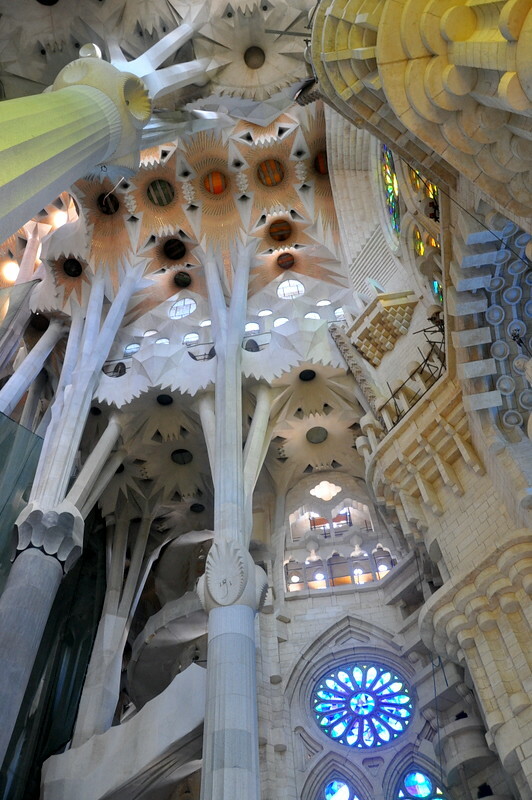 I personally suspect that Gaudi was an architect who didn't bother to consult the engineers and his plans can't be built or completed at all. I hope I'm wrong because I want to see SF completed. I'd love to pop into Barcelona occasionally just to see how much progress they make on SF. Gaudi was a sickly child and his mother is credited for instilling in him the love of nature when she took him for long walks in the forests. All his buildings are nature-inspired and themed. Design of columns inspired by tree nodes. 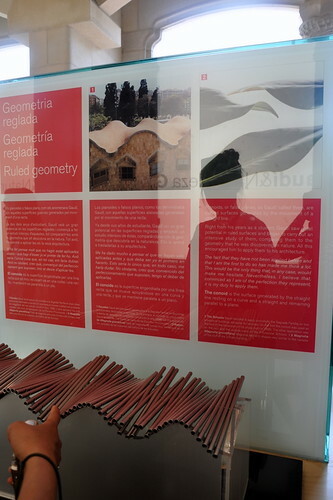 A model of the roof top of the school for workers' children. How hard it must've been to build this! 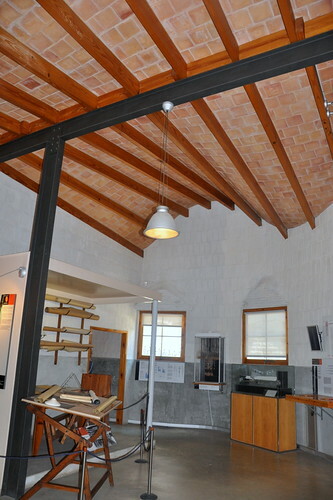 The school house for the workers' children which is now a showroom. 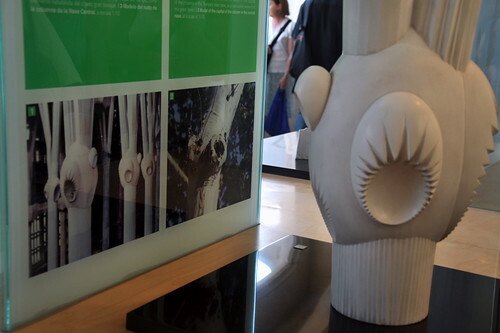 The columns were inspired by buttress tree trunks. 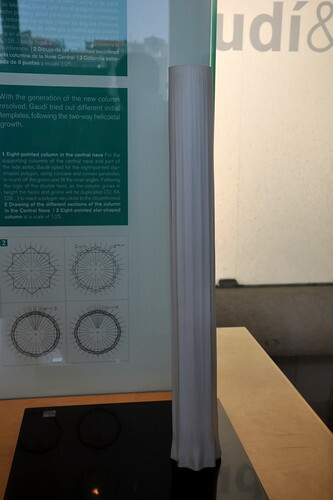 From about 8 angles at the bottom, the column are fluted with more lines as they rise so that at the very top, the 8 angles become a complete smooth circle. Gaudi was brilliant. 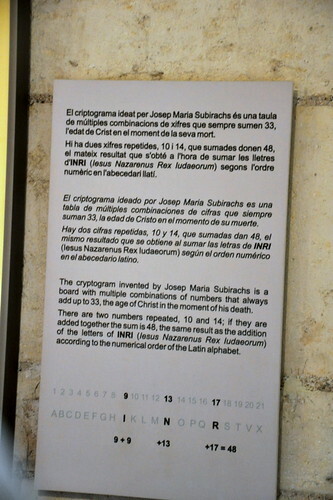 The cryptogram invented by the architect Josep Maria Subirachs who took over the construction of SF after Gaudi died. The combination of numbers always add up to 33, the age Jesus was when he died. Have you realized that many artists (except musicians) were also scientists? 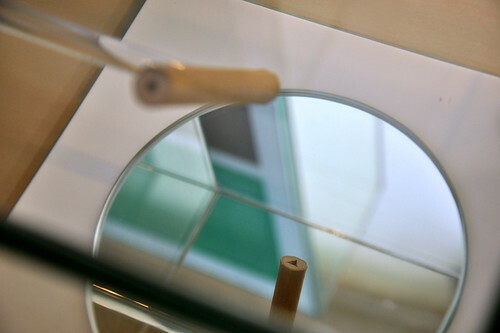 Famous people like Da Vinci and Michelangelo were multi-talented artists, scientists, mathematicians, engineers, architects, physicians, sculptors, all-in-one. The cryptogram reminded me of my father who loved mathematics and used his spare time figuring out mathematical questions. He could add, subtract and multiply big numbers quickly by drawing a big cross with numbers in each section (does anyone know that method?) but unfortunately none of us were good at math, so frightened we were of his high math standards and expectations. 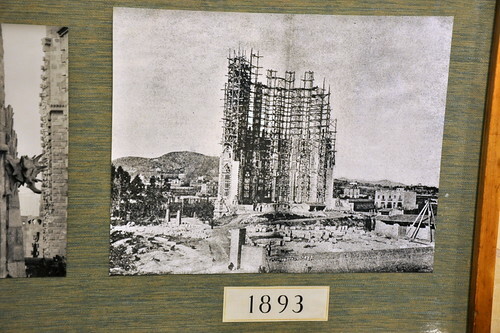 Construction of SF began in 1882/83. 10 years later, the building was like this. Today commercial buildings surround the church. An artist's impression of the completed SF. 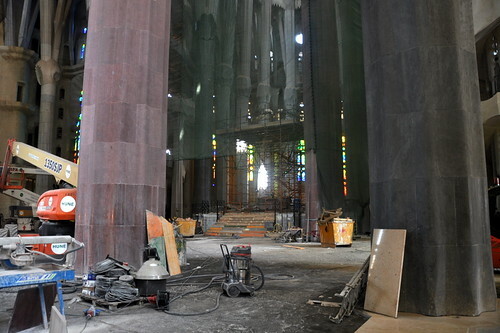 Do you think they'll be able to finish this church, considering that much of Gaudi's plans were destroyed during the war and that the building is probably too ambitious in the first place? Look at how much higher it has to go. When completed, the church will be 170 m. Look at how unusual and almost unearthly the final building will look, with clouds floating in the middle half of the building. Right now, only 4 spires are completed and there are 14 more to go! I don't think my generation, or the next, will see the completed SF. IF it gets completed. SF will be declared a basilica by the Pope on 7 November 2010. Wow, what amazing detail! I can imagine most people who see it for the first time just stop and stare for a while, because it's so strange and dramatic. I definitely want to go there one day and see it for myself now. A must do day in your lifetime. Be sure to book tickets online on the sagrada familia website to avoid hours of queuing. the email ticket on your mobile phone and you're in.